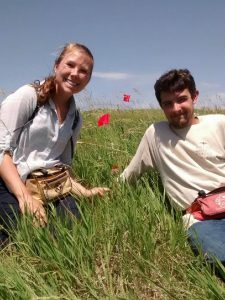 In summer 2018, I harvested 80 seedheads from 12 remnant Echinacea populations (ALF, EELR, KJ, NWLF, GC, NGC, SGC, NNWLF, LC, RRX, NRRX, YOH) to study patterns of reproductive fitness. I sampled heads in two ways – (1) I randomly selected 20% of the individuals at each site (43 individuals) and (2) I randomly sampled up to 5 individuals from full factorial combinations of high, medium, and low spatial isolation and early, peak, and late flowering time (i.e., high spatial isolation/early flowering, high spatial isolation/peak flowering, etc.) across all sites (37 individuals). 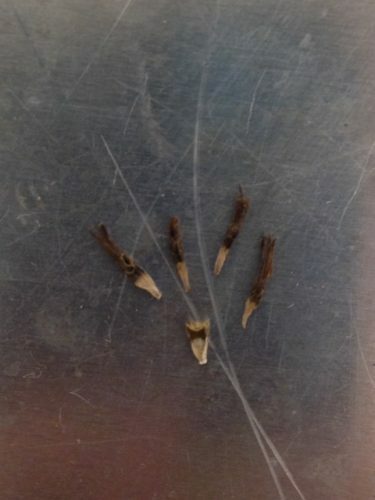 In January 2019, I dissected seedheads that I collected from the NW sites (ALF, EELR, KJ, NWLF, GC, SGC, NGC, KJ, NNWLF). I extracted the achenes by row to observe temporal variation in seed set within heads. 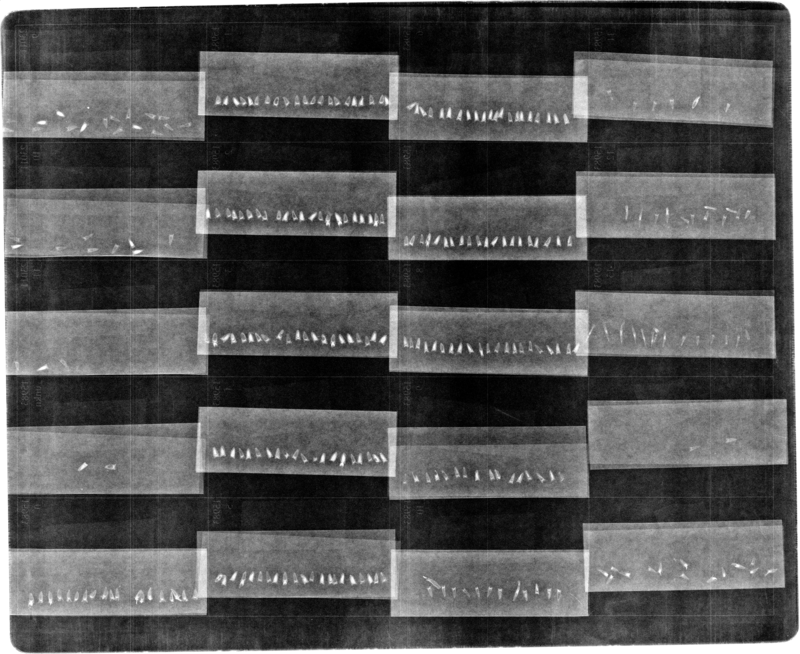 I x-rayed the achenes and assessed seed set in January. Products: Check back with the flog for preliminary results and annual reports. You can read more about reproductive fitness in remnants, as well as links to prior flog entries mentioning the experiment, on the background page for this experiment. Successful pollination leads to full achenes and higher fitness later in the season! 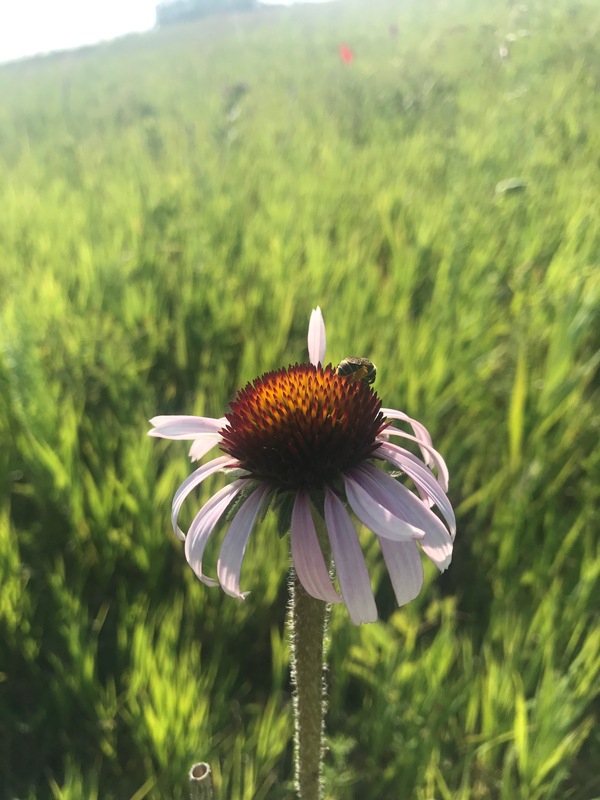 This summer we counted shriveled and non-shriveled rows of styles three times per week for every Echinacea head in 8 of the 28 remnant populations. We also harvested 121 Echinacea heads to be analyzed for seedset data. 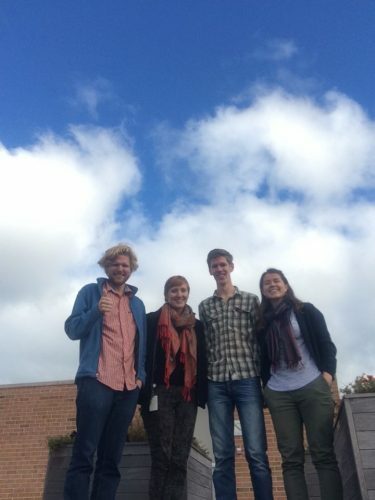 This year we selected heads for harvest based on their position within randomly selected plots where Tracie Hayes and Lea Richardson collected vegetation data. In every randomly selected vegetation plot, all species were identified and we recorded their abundance. We marked any Echinacea head within a vegetation plot for harvest. Harvested heads are ready to be processed by citizen scientists at the Chicago Botanic Garden. 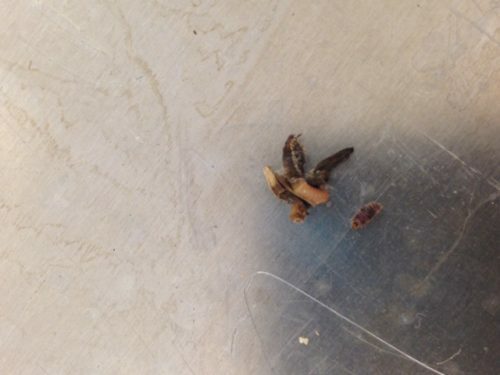 In the lab, heads will be cleaned so that all achenes can be counted and x-rayed to determine seedset. Measuring the reproductive success of an Echinacea angustifolia head gives insight into the fitness of the individual. In remnant populations, we measure reproductive success using two methods: style persistence and seedset. Seedset is the proportion of all seeds that are viable in an Echinacea head, and is measured in the lab after heads have been harvested. Style persistence is a fitness measure that can be taken during the field season. Styles, the showy female reproductive structures that emerge from every floret in an Echinacea head, shrivel within 24 hours if they receive compatible pollen. Keeping track of how many styles shrivel and how many persist can give us a sense of the reproductive success of that head without any lab work. Location: Roadsides, railroads and rights of way, and nature preserves in and near Solem Township, Minnesota. You can find out more about reproductive fitness in the remnants and read previous flog posts about it on the background page for the experiment. One of many visits to each flowering plant in prairie remnants. Assessing fitness is a key part of understanding change in any population. 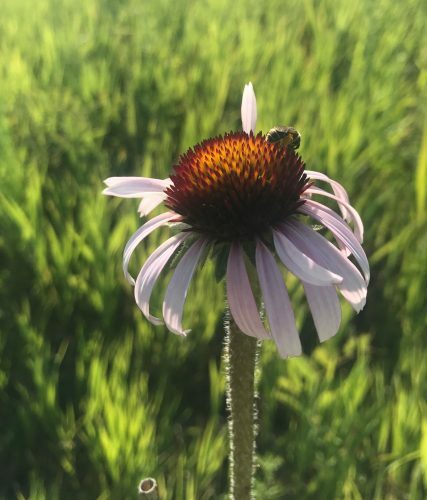 The Echinacea Project has focused on two quantifiable components of reproductive fitness of Echinacea angustifolia: style persistence and seed set. Styles shrivel when they receive compatible pollen, and thus persistence of styles reflects pollen limitation. A floret sets a seeds only when it has been successfully pollinated. Together, these two indicators can be used to predict how effectively individual plants produce viable offspring, giving insights into the persistence of remnant populations. This year, we counted shriveled and non-shriveled rows of styles on each flowering head of every plant in 28 remnants three times per week. Well after the flowering season, we harvested 104 heads at a subset of these sites. The harvested heads will have their achenes removed, counted, and x-rayed by citizen science volunteers to estimate how many seeds they produced. There were several concurrent projects this summer and in the lab that use these measures, including Amy Waananen’s compatibility study and James Eckhardt’s study of edge effects. Part 1. I couldn’t stay away from the Echinacea Project too long. As I’m positive you want to hear both about my poster that I will be presenting at MCMS tomorrow at the University of Chicago and my adventures in Chicago, I will share both. As I arrived at the airport to fly to Chicago, I realized I had forgotten my cell phone. I thought to myself, I lived most of my life without a cell phone, I can do it another day. After arriving in Chicago, I had thankfully packed a dollar in quarters, so I was able to use a pay phone (yes, those still exist) to call a cab. While I did struggle to understand the technology, I was finally able, after spending my only dollar in quarters, to procure transportation to the Chicago Botanic Gardens. I was left penniless, phoneless, and with only a laptop and my knowledge of Chicago (this, by the way, was absolutely nil). After making a successful rendezvous with the team, I enjoyed a lunch and tour of the lab. It was great to see everyone again. Part 2. After figuring out the best way to get to my destination at the University of Chicago, I jumped on the purple line, confident that, after a quick jaunt on the green line, all I’d have to do was walk a block or two to the hotel, where dinner awaited me. I hopped off the train, and quickly realized that the area had been highly developed since the last google street image had been taken, unless my memory of the picture failed me. Ah well, I thought, I wrote down the street that will get me to my hotel, it’s just east of here. The street just east was not the correct street. Maybe the map I saw was just wrong. By the next street, I knew I was in the wrong place. Thankfully a friendly man suggested a bus that would take me five miles to the east, where I thought I was getting off. Yes, I had taken the wrong train. All was well and good until I hopped on the bus and realized that I was penniless, with no money for a fare. Again, the bus driver was a greatly friendly man, and I rode the bus without a fare. Sailing was smooth from there on out. Off to share a room with someone I haven’t met yet. Day in the life. No explanation needed. Great to see y’all again.